Advanced Fantasy Baseball: Blog Wars 2013 Mixed 5x5 League...Let's Root for the Home Team! Blog Wars 2013 Mixed 5x5 League...Let's Root for the Home Team! In hopes that late is in fact better than never, I present herewith my Advanced Fantasy Baseball roster from the Blog Wars expert league. As I have mentioned time and again, I greatly prefer auctions to drafts, but a draft was the format selected for this league, so my duty was to "improvise, adapt and overcome". As it turns out, things went fairly well. By a stroke of bad luck, I drew the #7 pick, a universally despised position. At #7, you will not get one of the three "premier" first round players. You are not close enough to the wheel to have the advantage of having two picks close together. But, as with most things in life, you can make it work to your advantage. The first round went pretty much by the book. Ryan Braun fell first followed by the Triple Crown winner and then the Boy Wonder, Mike Trout. Of the three, Cabrera would have been my pick. Braun may put up better numbers, but it is no secret that MLB is on his case for PED issues. Whether he will be suspended for some time during the year is yet to be seen. I also worry a little about the psychological pressures he must be under as the target of a massive investigation. As for Trout, his 2012 season was truly one for the ages. But, take a long breath and tell me what should make us believe he can do it in his second big league season. He may do as well, or even better, but he lacks a track record...something Miggy clearly has. The next three picks were Kemp, Cano, and McCutchen, in that order. None of these selections give me any particular heartburn, but with high first round picks one should maximize predictable value, not upside. With Kemp, whose talent is unquestioned, there are some nagging health issues. Robinson Cano has a history of monster seasons, but it takes him 650 at-bats a year to pull this off. With so many Yankee stars on the DL or ready for retirement, one must wonder who there will be to drive Cano in, or who will be on base for him to drive in. Andrew McCutchen is clearly a fantastic young player, but one who has not yet reached his peak or established a level of consistency. Had this been a keeper league, though, McCutchen would have been my pick. As it is, I probably would have gone with Cano and crossed my fingers for his mates to get healthier. That left it up to me at #7. Generally, the first round means find the best player available. In addition, I planned to grab power, batting average, and reliability. 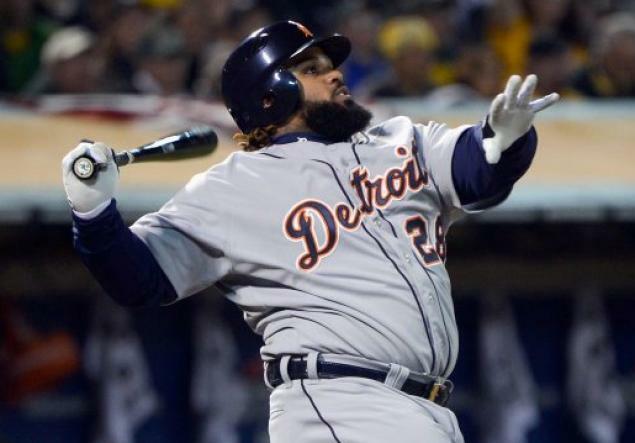 I found all those things in a very large package named Prince Fielder. This meant passing up on numerous legitimate first round candidates, including Joey Votto and Carlos Gonzalez, both of whom I love, but both of whom present some health issues. Ditto Albert Pujols and his knee. As for Giancoarlo Stanton, I was bothered by the quality of the hitters around him. When your sole protection is Placido Polanco, you have some issues. Justin Upton and Jose Reyes would have been fine picks as well, but I reminded myself that my first rounder had to be a person with good reliability as well as mammoth power and an excellent average. Welcome to the team, big man! Three big name pitchers went early in the second round...Strasburg, Verlander and Kershaw. I was a little surprised that the three went 3, 4 and 5 in the second round. Kershaw I can see as a second round pick, but Verlander was, IMO, overdrafted here. As for Strasburg, my thinking was similar to that regarding Trout - show me you can do it for a full season, twice. So for my second round selection, I went with Dustin Pedroia. He's not a true masher, like Fielder, but he does have 20-25 home run power. There were two more factors I considered here. One is that second base is a very thin position at the top. The other is that Boston may run more this year than we've seen in a while, due to the tendencies of their new manager, John Farrell. Pedroia will be on base plenty, and has the wheels to pick up 30 or more steals if he gets the green light. Plus he gives me more plus average, which may be a scarce commodity this year. Before my third round pick, four more top line starters would fall, including Price, King Felix, Hamels and Matt Cain. It became abundantly clear to me that I would not get one of the top starting pitchers if I didn't take one in the third round. Available were Cliff Lee, Yu Darvish, Bumgarner, Weaver and Dickey. But I was still looking for reliable power, and it came in the form of Yoenis Cespedes, a hitter I believe could turn in an MVP season. No, he does not meet my test of "do it twice", but he is a hitter we have watched for years in his native country, and there are few who doubt this guy's ability to rake. The fourth round presented a difficult decision. I had not planned to take pitching early, yet I had seen all the top starters fly off the board. I was also mindful of the fact that "closer" has even less job security than "NFL placekicker". A really good closer, in addition to providing you help in the Saves category can, essentially, turn an average starting pitcher into a Cy Young candidate. By that I mean that in addition to saves a really good closer will give you a ton of Ks, an ERA around 2.00 or less, and a Whip of 1.00 or less, as well as a handful of wins. Add those numbers to an average starter, and his resulting numbers are outstanding. By contrast, some closers will not only fail to help you in ERA and Whip, but can actually hurt you there. And, they can lose their jobs in the process. In my opinion, the closer who provides the best projected stats and job security is Craig Kimbrel. He is the only closer I would consider taking early in a draft (with the possible exception of Aroldis the Red). Plus, given the fact that so many starters had already been taken, I figured that I had to get Kimbrel right then if I expected to roster him at all. So, welcome Craig Kimbrel. Of course, the next owner in line took Chapman. He told me he would have taken Kimbrel had I not done so. The next four rounds were used to fill out my infield and add a couple of outfielders. Some players I believed were being undervalued, and should have strong years in 2013 are Shane Victorino, Martin Prado, Erik Aybar and Melky Cabrera. Melky may have been a reach, but I think there's a good chance he'll have a big year, unless he was nothing more than a product of PEDs. I took my first starting pitcher in Round 9, and the honor went to Ian Kennedy. He was the 30th starting pitcher taken, and a bit of a bargain as the 127th player overall. The rest of the draft consisted of picking the best offensive players available. I tried picking as many pitchers with high upside as possible. Among the hitters I was very happy to roster were Chris Davis in Round 10 and Dexter Fowler in Round 13. Happily, each of them has gotten off to a hot start. They will undoubtedly slow down some, but I think they are both guys who will exceed expectations and deliver big in 2013. My other hitters were Yonder Alonso, Aaron Hicks, Hiroyuki Nakajima, Carlos Ruiz, Alex Avila and Rajai Davis. Nakajima appears to be a miss, but I think the Athletics would like to get him back up and playing ASAP in order to justify their investment in him. I chose relievers Casey Janssen, Ryan Cook and David Hernandez to join Kimbrel in my bullpen. I think Janssen is being undervalued this year, mostly by people who think Santos will claim the job. Janssen has the stuff to close. As for Cook and Hernandez, they should put up stellar qualitative stats, and could work themselves into position to garner a few saves. I think each of these guys have the potential to turn in solid seasons. Davis and Myers have looked pretty bad so far, but fantasy baseball is a marathon, not a sprint. And while they won't put me on top of any of the pitching categories, I'm counting on my offense to make up the difference or at least give me someone to trade for another starting pitcher. In the meanwhile, I will be diligently working the waiver wire. Already, I have placed Nakajima on the DL and purchased Maicer Izturis as a free agent. I also added some outfield depth with Chris Heisey, dropping David Hernandez in the process. With some luck and good health, this lineup should produce 1100 runs, 250 homers, 1000 ribbies, 200 stolen bases, all with a .282 average. On the pitching side, I'm projecting 85-90 wins, 85-90 saves, and around 1150 Ks. ERA and Whip may be an issue. Right now I'm thinking 3.65 and 1.23, which won't place very well in this league. So there it is...the Advanced Fantasy Baseball entry in the Blog Wars league. I'll be posting progress reports from time to time. In the meantime, any comments, critiques, or suggestions will be appreciated.